Sensory beauty, whether it be in feats of architecture or calligraphy, has long been a pursuit of Islamic civilisation. Achievements such as the Alhambra pertain to this fact. This article further describes the results of Muslims striving for beauty in their environment. Figure 1. A garden in Topkapi Palace, Istanbul (Source). So many people are critical of Muslim society today, with its seemingly chaotic urban condition, and the Muslim's little care for their natural environment. So many critics tend to unjustifiably blame this on Islam. This is contrary to the truth as some ten centuries ago, when Islamic society was closer to its faith, the situation was all too different. "It is only necessary to go through the literary and artistic works of the Arabs," says Le Bon "to notice that they always sought to embellish nature. The characteristic of Arabic art is imagination, the brilliant, splendour, exuberance in decoration, fantasy in the details. A race of poets - and poets doubled with artists. Having become rich to achieve all their dreams, they bred those fantastic palaces which seem to be sculptures of marbles engraved with gold and precious metals. No other people have possessed such marvels, and none will ever posses them. They correspond to an age of youth and illusion gone for ever. It is not to this epoch of cold and utilitarian banality, which humanity has now entered where they could be sought ." "Europe at the present day does not offer more taste, more refinement, more elegance, than might have been seen, at the epoch of which we are speaking, in the capitals of the Spanish Arabs. Their streets were lighted and solidly paved. The houses were frescoed and carpeted; they were warmed in winter by furnaces, and cooled in summer with perfumed air brought by underground pipes from flower-beds. They had baths, and libraries, and dining-halls, fountains of quicksilver and water. City and country were full of conviviality, and of dancing to the lute and mandolin. Instead of the drunken and gluttonous wassail orgies of their Northern neighbors, the feasts of the Saracens were marked by sobriety. Wine was prohibited. The enchanting moonlight evenings of Andalusia were spent by the Moors in sequestered, fairy-like gardens or in orange-groves, listening to the romances of the story-teller, or engaged in philosophical discourse; consoling themselves for the disappointments of this life by such reflections as that, if virtue were rewarded in this world, we should be without expectations in the life to come; and reconciling themselves to their daily toil by the expectation that rest will be found after death - a rest never to be succeeded by labor ." "The Period of Samarra's supremacy (836-83), so far as art was concerned, was one of the most brilliant in Islamic history; at no time before had so much been built in so short a space of time or had such elaborate decorations been devoted to such large a number of houses as well as mosques and palaces. As one wanders over this immense field of ruins one can but marvel at the age which was responsible for such lavishness ." During the Muslim period, the view of Malaga from any point was mostly enchanting. From Velez to Fuengirola, a distance of more than forty miles the coast exhibited an unbroken series of fig plantations . The mountains in the rear were enveloped in a haze of mingled tints of crimson, orange, and violet, and on the southern horizon, the sapphire blue of a sky without a cloud blended almost imperceptibly with the deep ultramarine of the sea . Viewed at a distance, the white buildings with their red roofs nestling in a wilderness of verdure whose foliage displayed every tint of green, the harbour doted with hundreds of snowy sails, the numerous mosques, with their elegant towers encrusted with glittering tile work, the palaces of the noble and the wealthy decorated with all the caprices of Muslim architecture, and each surrounded by spacious and shaded grounds, the boundless profusion of limpid and refreshing waters, bearing fertility to every garden and comfort to every household, the interminable plantation of every fruit that contributes to the sustenance and enjoyment of every human, all presented a landscape whose counterpart probably did not exist in the most favoured regions of the inhabitable world . Islamic civilisation was not the only one that gave aesthetics a dominant place, but it remains the first that made them all encompassing, importing and affecting the essence, the form, and also the inner and the outer, and the concrete and the natural. Luxury and reproduction of human forms is banned in Islam, this prompted artists to excel in elaborate creativity. The typical Islamic decoration was one based on interlacing lines and geometric designs and one that used much colour; one thinks of the coloured tile and the carved and painted arabesque as the common decorative means of Islam . The Muslim artists invented the art of decoration and transformed it into the arabesque, a non-developmental design that extents in all directions as infinitum . The Muslims, Artz notes, spending vast sums on objects where the greatest cost was not in the material but in the workmanship lavished on it, using inscriptions in the wonderful Arabic calligraphy, the most beautiful that man has devised, as a common decorative motive . In the embellishment of Islamic life all the arts mingled like the interlaces of a decorative theme, and as result, the patterns of illumination and calligraphy were woven into textiles, burned into pottery, and mounted on portals and mihrabs . In all their designs—on walls, on leather, and on cloth—they liked patterns that were not centrally organised but that went on, in all directions, without either a beginning or an end . The arabesque, Al-Faruqi explains, transfigures the object of nature it decorates-whether textile, metal, vase, wall, ceiling, pillar, window, or page of a book-into a weightless, transparent, floating pattern extending infinitely in all directions . The object of nature is not itself but is trans-substantiated, and has become only a field of vision; aesthetically, the object of nature has become under the arabesque treatment a window onto the infinite . In this endeavour, the Muslim artist was assisted by his linguistic and literary legacy. To the same end, he developed the Arabian script so as to make it an infinite arabesque, extending non-developmentally in any direction the calligrapher chooses . The same is true of the Muslim architect whose building is an arabesque in its façade, elevation, skyline, as well as floor plan . These ingenious skills were combined with the use, in ceilings, of stalactite forms and types of complicated coffering; the designs of both tiles and arabesques showing marvellous taste, ingenuity, and inventiveness . The mosque of Cordova is certainly one of the most written about for its aesthetics as much as its impact on subsequent buildings. In its earliest form it was a courtyard mosque of a rectangular plan, with a sanctuary of eleven aisles akin to that of the original al-Aqsa mosque at Jerusalem and with horseshoe arches like those at Damascus topping the arcades . It was repeatedly enlarged in 833 by Abd Ar Rahman II and again in 965 by Al-Hakam II, when the great dome in front of the mirhab was completed. Subsequent rulers such as al-Mansur (late 10th century) added further enlargements. The mosque is a very remarkable structure and represents something quite new, notes Talbot Rice, for the dome is supported on a series of intersecting ribs . The hexafoil arches in two tiers also represent a new and original departure in Islamic architecture . Visually, the attractiveness of the mosque interior has been caught by Burckardt . Scott has also managed to capture a very interesting detail, lacking in every other work that is the lighting of the Mosque . The interior of the mosque, by reason of its vast extent and its comparatively low ceiling, was more or less obscured, even at noon, and lamps were kept constantly burning by its ailes; two hundred and eighty chandeliers of brass and silver suspended from its arches, the oil used in them being perfumed with costly essences; the largest of these containing 1454 lamps, and measuring 38 feet in circumference; and its reflector containing 36000 pieces of silver fastened with rivets of gold. Beauty was enhanced by the gems, and by the combined effect of the mirrors, the light was increased, thus, to nine times its original intensity. During the entire month of Ramadhan the mosque was illuminated with twenty thousand lights. An enormous taper, weighing sixty pounds, was placed in the Maksurah. Its dimensions were calculated with such accuracy that the wax was completely consumed during the last hour of the last day of the festival . The intensity of light due to the great number of lamps used is no exaggeration, or unique; Artz speaks of the Mosque of Damascus being lit by thousands of hanging lamps of metal and of enamelled glass . "They are made even more inward-looking and cloistered by the downward pitch of their roofs as seen from the courtyard. Yet the organization of space within the building is by turns ingenious and dramatic. On the first floor the needs of circulation and accommodation are admirably dovetailed; the corridor which encircles the courtyard and gives access both to individual cells and to the corner staircases is kept so narrow that two people can barely squeeze past each other in it. This frees extra space for accommodation. At the same time, it is no mere walkway but has some aesthetic distinction. The openings at regular intervals along its shaded length allow the viewer to catch partial glimpses of a courtyard bathed in sunlight. Most Moroccan madrasas have a central pool with a fountain. Given the somewhat cramped dimensions of these courtyards, the presence of rippling water sets space into motion to a degree that would not be possible in larger expanses. This introduction of nature into the ordered, man-made world of architecture is typically Islamic. These fountains serve a further, more directly scenic, function too. For anyone within the halls bordering on the courtyard, the view into that courtyard is firmly directed by the act that the only entrance to these halls is a single arch. On the major axes of the madrasa this arch frames the fountain, which thus becomes the centerpiece of a carefully calculated composition ." "I have also heard of the magnificence and good design of its buildings; most of which, not to say all, are abundantly provided with running waters, and spacious courts planted with fruit trees, such as oranges, the lemon, the lime, and the citron tree. The sciences and the arts are cultivated with more or less ardour, with more or less success; the number of their authors is indeed too considerable to be stated, and their writings too well known to need description ." "From a royal villa, Medina al-Zahra insensibly expanded into a miniature city. Around the palace clustered the luxurious dwellings of the courtiers, the merchants, and the officers of the army. The avenues were lined with trees, whose foliage formed a continuous arch. Not a house could be seen that was not embosomed in gardens abounding with gushing water and rare exotics. Even the sides of the Sierra had been stripped of the sombre growth of the evergreens which had originally covered them, and, planted with fig and almond trees, appeared in all the beauty of luxuriant foliage and fragrant blossoms. Not far away, extensive plantations of the sweetest of flowers gave to the locality the name of Gebal al-Wardat, the Mountain of the Rose ." Natural beauty, as the last lines just caught, occupying so great place in early Islamic life; just as they appreciated the beauty of their cities, the Muslims appreciated and cared much for the beauty of their surrounding natural environment. Through the preceding instance, Islamic civilisation, it has become obvious, gave a larger place to greenery. Medieval Islamic civilisation, Armesto tells, was "a civilisation, which thought of itself as a garden, gardening was naturally an esteemed art ." In the words of garden historians, the inhabitants of the early Islamic world were, to a degree that is difficult to comprehend today, "enchanted by greenery ." Scott describes how the Muslims "introduced on a diminished scale the hanging gardens of Babylon. In floral ornamentation they had no superiors. They contrived labyrinths, artificial grottoes, concealed fountains. They traced texts and inscriptions by means of gorgeous blossoms on a ground of living emerald. The intricate designs of tapestry were imitated by an infinite variety of flowering plants, whose tints blended in perfect harmony, like the colours of the material they were intended to represent. They acquired such dexterity in the culture of roses that, at all seasons of the year, they bloomed in profusion in every garden ." Figure 3. 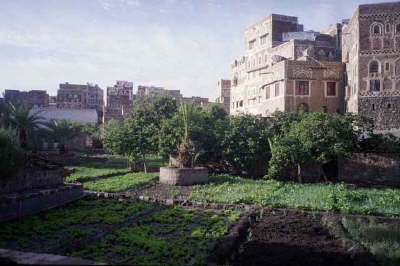 A garden in Sana'a (Source). "Surely the God fearing shall be among gardens and fountains." (Qur'an: 51/15). "And those on the right hand; what of those on the right hand? The part played by gardens in the past and present life of the Muslim people appears to stem from the conception of Paradise, the ideal garden, as portrayed in the Qur'an, which paints so detailed a picture of the state of blessedness reserved exclusively for Believers that it might have served as a model for the creators of gardens in both East and West . The notion repeated in the Qur'an of Paradise as a garden (al-janna, "The Garden") is symbolised in the form of Andalusi gardens, a few of which survive physically and some of which are described in literary sources, tells Glick . The form of these gardens, quadripartite rectangles with fruit trees arranged in rows parallel to an axial watercourse; the symbolic value of the formal Islamic garden being an earthly anticipation of paradise . "If the garden was such a ubiquitous art form in the Muslim world, being both socially and geographically extensive, there must have been specific reasons for this propensity…" First comes "the idea of Paradise as a reward for the Muslim faithful," a garden, descriptions of which have "played an important part in the Muslim cosmography and religious belief ." Gardens were created in the first centuries of Islam and spread across the Islamic world, from Spain to India, tells Dols . A well-known example of the Islamic garden is the Court of the Lions in the Alhambra, the four plots of which originally held herbs and flowers. But Dols points out, from the large and lavish botanical gardens of the rich to the small gardens and terraces of the poor, gardens were a distinctive cultural trait of Islamic society . "Long indeed would be the list of early Islamic cities which could boast huge expanses of gardens," Watson holds . Al-Fustat, in Cairo, with its multi-storey dwellings, had thousands of private gardens, some of great splendour . These are mainly the product of its Tulunid era of Egypt in the 3th/9th century. In the houses of Fustat, which can be assigned to this period, the rooms opened on to a central court in which brick-lined hollows were dug; some of these were filled with water, others with soil for growing plants . The townsman, moreover, showed a remarkable taste for gardens. The Persian traveller Nasir-i Khusraw draws attention to those which adorned the terraces. An irrigating machine on the top of a seven-storey house and operated by oxen was used for watering orange, banana and other fruit trees as well as many kinds of flowers and fragrant plants . "The New Kiosq is a palace in the midst of two gardens. In the centre was an artificial pond of tin (or lead), round which flows a stream in a conduit, also of tin, that is more lustrous than polished silver…. All around this tank extended a garden with lawns with palm trees… four hundred of them… The entire height of those trees, from top to bottom was carved in teakwood, encircled with gilt copper rings. And all these palms bore full grown dates, which in almost all seasons were ever ripe and did not decay. Round the sides of the garden also were melons… and other kind of fruit ." Figure 4. A garden in Topkapi Palace, Istanbul. In Turkey, Ettinghausen says: "devotion, if not mania" for pretty flowers, was prevalent everywhere, and in their multitude; fondness for tulips in 16th century Turkey in particular having a profound influence on Europe . In Muslim Spain, writers speak endlessly of the gardens and lieux de plaisance of Seville, Cordova and Valencia, the last of which was called by one of them "the scent bottle of al-Andalus ." In the vicinity of Malaga, covering the slopes of the Sierra, were groves of oranges and pomegranates; the vineyards were the most extensive, and the grapes the most luscious of Muslim Spain; the belt of frowning grey walls which enclosed the city was relieved by the palm trees, which at frequent intervals overtopped them . "One found there," he tells us, "a forest of trees, some of which were trained on to trellises, while the rest were left to grow in complete freedom. The branches of the lemon and orange trees mingled with those of the cyprus, while below, the myrtle and jasmine smiled upon the water-lily. In the midst of these groves, a large garden encircled a lake so vast that it might be taken for an ocean. Water was brought there by the ancient aqueduct [which in former times supplied Carthage and which the Hafsid al-Mustansir had repaired]. Following this conduit, the waters gush through a huge outlet into a square reservoir [serving as a decantation basin] and thence, through a fairly short canal, to the great pool which they fill in swirling torrents. At each end of the pool stands a pavilion, one large, one small, whose roofs rest on columns of white marble and whose walls are faced with marble inlay ." In Algiers, a visitor once counted 20,000 gardens, and all around the city grew all sorts of fruit trees; and great varieties of flowers, and all sorts of plants; abundant fountains, and in these gardens, on the lush greenery, families used to come and find enjoyment and solace . The gardens of the beautiful country houses which are scattered about the outskirts of Algiers were among the luxuries enjoyed by the Corsairs and were tended by a vast number of their captives who laboured in them all the year round . Fisher offers an excellent outline of this from the description of Western travellers to Algiers to contrast with the image from the West . Hence in the city, like many subsequent writers, the traveller Haedo tells of well watered gardens and vineyards outside the city, luxuriant with fruits, flowers, trees and vegetables, each with at least a little white house, which were used for picnics and for retirement in the summer . Haedo puts the numbers of such gardens at 12,000 although the figure could well have been 18,000; figures which indicate a pleasant, peaceful and orderly way of life . This is a huge contrast to what the same observer will see today in the same country. "Gardening is an ephemeral form of monumental art, and only the faintest inkling of the environments they (Muslim botanists) created for their patrons can be got from surviving Moorish gardens of a later age in Granada and Seville. 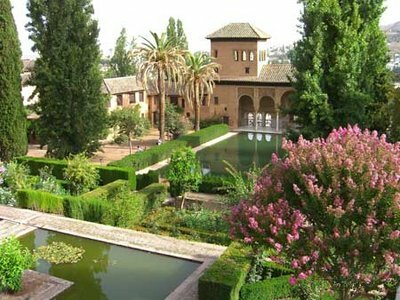 The way of life which the gardens formed part, however, can be envisaged readily enough in an imagination stimulated by Moorish art, which in the late 10th century assumed its most delicate forms and opulent aspect ." "For the Muslim, nature is a ni'mah, a blessed gift of God's bounty, granted to man to use and to enjoy, to transform in any way with the aim of achieving ethical value. Nature is not man's to possess or to destroy, or to use in any way detrimental to himself and to humanity, or to itself as God's creation. Since nature is God's work, his ayah or sign, and the instrument of His purpose which is the absolute good, nature enjoys in the Muslim's eye a tremendous dignity. The Muslim treats nature with respect and deep gratitude to its beneficial Creator and Bestower ." G. Le Bon: La Civilisation des Arabes, Algiers: Ed. E.N.S.D., 1962, p. 402. JohnWilliam Draper: History of the Conflict between Religion and Science. Henry S. King & Co, 1875, reissued by Cambridge University Press, 2009, pp. 140-1. D. Talbot Rice: Islamic Art, Thames and Hudson, London, 1979, p. 97. S.P. Scott: History of the Moorish Empire in Europe (1904), available at http://archive.org/details/historymoorishe03scotgoog. Reprinted in 1977 by the AMS Press and in 2010 (vol. 1) by General Books, vol. 2, p. 620. Ibid, vol. 2, p. 620-1. Ibid, vol. 2, p. 621. Frederick B. Artz, The Mind of the Middle Ages A.D. 200-1500: An Historical Survey. New York: Alfred A. Knopf, 1953, p. 174. Ismail R. al Faruqi and Lois Lamya al Faruqi, The Cultural Atlas of Islam, New York: Macmillan, 1986, p. 88. F. B. Artz: The Mind, op. cit., p. 174. W. Durant: The Age of Faith, New York: Simon & Schuster, 1950,, p. 278. F. B. Artz: The Mind; op cit. ; p. 174. I-L Al-Faruqi: The Cultural Atlas, op. cit., p. 89. D. Talbot Rice: Islamic Art, Thames & Hudson, 1975, p. 77. T. Burckhardt: Moorish Culture in Spain, George Allen & Unwin, London, 1972. S.P. Scott: History; op. cit., p. 663. F. B. Artz: The Mind; op cit., p. 148. R. Hillenbrand: “Architecture in Madrasa”, Encyclopaedia of Islam, vol. V, pp. 1134 ff. In Al-Maqqari: Nafh al-tib min ghusn al-Andalus al-ratib, ed. Ihsan 'Abbas, Beirut, 1968, p. 56. Al-Shaqundi, Risala, in Al-Maqqari, Nafh Al-Tib, op. cit., p.56. T. Glick: Islamic and Christian Spain in the early Middle Ages, Princeton University Press, New Jersey, 1979, p. 237. S.P. Scott: History, op. cit., vol. 2, pp. 316-9. F.F Armesto: Millennium; A Touchstone Publication, New York: Simon and Shuster, 1995, p. 35. D. Sourdel: « Baghdad: Capitale du Nouvel empire Abbaside », Arabica, vol. 9, 1962, pp. 251-65; J. Sourdel Thomine: La civilisation de l'Islam, Paris, 1968; J. Dickie: « Nosta Sobre la jardineria arabe en la espana Musulmane », Miscelanea de estudios arabes y hebraicos XIV-XV (1965-6), pp 75-86 ; G. Marçais: « Les Jardins de l'Islam », in Melanges d'Histoire et d'archéologie de l'occident musulman, 2 vols., Alger, 1957, pp. 233-44. S.P. Scott: History, op. cit., p. 605. G. Marçais: “Bustan”, Encyclopaedia of Islam, vol. 1, pp. 1345-7; at p. 1345. T. Glick: Islamic and Christian Spain in the early Middle Ages, op. cit., p. 54. R. Ettinghausen: Introduction, in The Islamic Garden, ed. by E.B. MacDougall and R. Ettinghausen; Dumbarton Oaks; Washington; 1976; p. 6. M. W. Dols: “Herbs, Middle Eastern”, Dictionary of Middle Ages; Joseph R. Strayer; Editor in Chief; Charles Scribner's Son; New York; 1980 fwd. ; vol 6; pp. 184-7; at p. 186. A.M Watson: Agricultural Innovation in the Early Islamic World, Cambridge University Press, 1983, p.117. G. Wiet: Cairo City of Art and Commerce, Norman, Oklahoma, 1964, pp. 17,19, 22. G. Marçais: “Bustan”, op. cit., p. 1346. Al-Duri: Tarikh al-Iraq, Baghdad, 1948, pp. 26-28. Yaqut: Muʿdjam al-buldān [Jacut’s Geographisches Wörterbuch]. Bände I–VI. Ed. F. Wüstenfeld, Leipzig 1866–73; 1924. Reprint Tehran 1965; Beirut 1955–1957; Frankfurt 1994, vol. 4, p. 787. Elisabeth B. and Richard Ettinghausen, The Islamic Garden, edited byDumbarton Oaks, Trustees for Harvard University, Washington, DC, 1976, p. 3. E.Herzfeld: “Mitteilungen uber die Arbeiten der zweiten Kampagne von Samarra,” Der Islam, vol. 5, 1914, p. 198. E. B. and R. Ettinghausen, The Islamic Garden, op. cit., p. 5. H. Peres: La Poésie Andalouse en Arabe Classique au XIéme siècle, Paris, 1953, pp. 115 ff. S.P. Scott: History; vol 2; op. cit., p. 620. Torres Balbas: « La Ruinas de Belyunes o Bullones », Hespéris Tamuda, vol. 5, 1957, pp. 275-96; 275 ff; G. Marçais: Les Jardins de l'islam; op cit. G. Marçais: « Bustan », op. cit., p. 1347. Ibn Khaldun: Histoire des Berberes, trans by de Slane, Paris, vol. 2, pp. 339-340. G. Marçais: Les Jardins; op. cit., p. 241. G. Marcais: “Bustan”, op. cit., p. 1347. G. Fisher: Barbary Legend, Oxford, 1957, p. 99. F .Fernandez Armesto: Millennium; Simon and Shuster; London; 1995. p.37. I. R.and L.L. Al-Faruqi: The Cultural Atlas of Islam; op cit; p. 322.